The Hayward touring exhibition Every Day is a Good Day was the first major retrospective in the UK of the visual art of the American composer and artist John Cage. 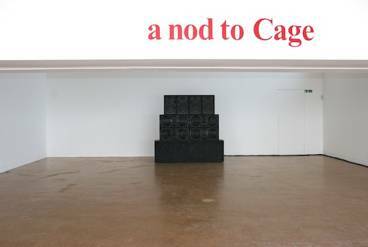 To sit alongside this exhibition the De La Warr Pavilion presented 'A Nod to Cage', a rolling programme of artists' projects that responded to Cage's work. The aim was to solicit contemporary, instinctual responses to Cage reflecting the anarchic impulses that underpinned his approach to the world and making art. Shelley Parker performed a live set of environmental recordings sourced from audio samples recorded from the roof of the De la Warr Pavilion layered with minimal pulses, bass driven drones and noise. 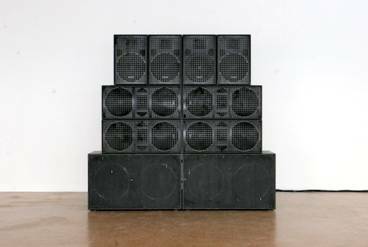 Drawing from material from the sound installation Bird Cage, she investigated the acoustic space inherent in the buildings architecture alongside her signature style of distortion, found sounds and low end bass frequencies. Sourcing inspiration from John Cage's piece 'Bird Cage' (1972), the project sets out to examine elements of chance, texture, repetition and social space using sound in a site-specific context. Bird Cage sonically compromised of a real time live feed picking up external sound sources, for example, seagulls, sea and traffic from the roof of the pavilion. 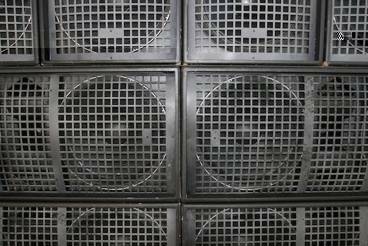 In the gallery space stood a monolith of speakers streaming the live feed alongside layers of continuous bass drones and pulses of low end frequencies.